PETA’s sign on busy I-70, a couple of miles from the Denver Dog Show Cluster site, was on local news, social media-and everyone’s minds. PETA made its presence known with this sign. Reactions were strong and anger rampant. How dare they make it sound as though WE are at fault for dogs being in shelters!?! The Dog Show industry is shrouded in mystery. It is very hush hush. Newbies find it hard to break into the Good Old Boy mentality and unless they persevere or find a Mentor, they give up. Very few have the opportunity to share what we have- the work and time spent growing and training a dog. The Hopes and Dreams. Seeing our dog take that first win. Sharing our joy and excitement with others who understand what it means. Supporting one another and getting to know each other at the shows. It’s a different world and I love it! I am relatively new, still learning the ropes. I still get a rush when I haul my equipment into the grooming area to set up and hear dryers going full blast and dogs barking. The National Anthem each morning makes me tear up, because darn it, how blessed are we that we can do this? We are so protective of our dogs, of our lives, and each other. How can people think that we are basically puppy mills producing hundreds of pups every month to drag along on the end of a leash? It is time we stepped out of the shadows. We are human. We work, we have families. We just happen to enjoy this addictive sport called Dog Showing. 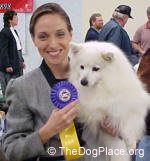 When people see dog shows on TV, they see the glamour and glitz of Westminster or Eukanuba. Apparently PETA doesn’t see the love and the years of dedication to what is really an art form. How many PETA people spend sleepless nights holding a sick or weak puppy? So, what are we going to do about this? When is each breed going to make more of an effort to welcome potential dog people into our fold? We need to educate adults as well as children about the importance of health testing, why we show, and encourage them to become involved in some way. Either as a Jr. Handler, 4-H or FFA. We need to start by getting the word out. Yes, some purebred dogs do end up in shelters. Most are from puppy mills, not dedicated hobby breeders. We take our dogs back at any age, no questions asked. We need to pressure the AKC and breed clubs to stop registering pups from those who have multiple pups each year. We need to educate the Public that there are only two REAL registries in the U.S., AKC and UKC. If someone tells you the pup is registered in another registry- RUN. We must let it be known that we health test and that we donate to health research to find causes and cures for our breeds health problems. How do we achieve this? More Meet The Breed activities outside of the shows. We are so busy showing that sometimes we don’t give the best impressions to others. We need to get our message out on local TV, radio, newspapers, etc. And especially by word of mouth. Let’s face it- We are suspicious of people coming to grooming areas asking questions. You never know if they are honestly interested in your breed or if it’s a radical animal rights PETA member making contact in order to injure you or your dog. Most of all, we need to open up and let people know that the Beagle that just won Westminster is just like their dog at home. He likes to nap on the sofa, chew on squeakies, and eat your shoes. There is nothing mystical about us. We are just plain folk who love dogs and all that comes with them. See ya around the ring.